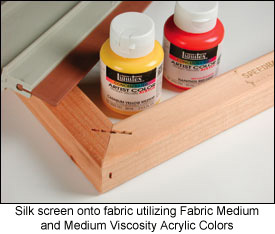 Liquitex Professional Artist Acrylic Colours offer artists a non-toxic approach for silkscreen techniques. Consistency of extra heavy cream. Easier to silk-screen through tight mesh screens. Dries quickly on absorbent surfaces, such as paper. Consistency similar to oil paint. Less likely to spread or “bleed” when screen printing onto fabric. Generally prints more opaque because of thicker paint application. May clog in tight mesh screen. Mix any amount of Liquitex Slow-Dri Blending Gel Medium or Gel Medium with Liquitex Soft or Heavy Body Artist Colours to slow drying time. Transparency of colour will increase proportionally with the amount of medium added. Mix Liquitex Slow-Dri Blending Fluid and Gel Mediums to attain an intermediate consistency. Mix up to 25% Liquitex Slow-Dri Blending Fluid or Slow-Dri Blending Gel with Liquitex Soft or Heavy Body Artist Colours to slow drying time 50% and allow for better transfer of paint to paper during printing, without significantly affecting opacity. Mix Liquitex Slow-Dri Fluid and Slow-Dri Blending to attain intermediate consistency. Prepare all paint necessary for printing before beginning. Work quickly. Do not stop during printing. Pre-wet screen with 1 part Liquitex SlowDri Fluid Retarder and 1 part distilled water. To prevent paint from drying on screen during printing, periodically spray screen during printing with 1 part Liquitex SlowDri Fluid Retarder and 1 part distilled water. Too much spraying may cause paint to spread (“bleed”) on paper. For spot cleaning during silk-screen printing, remove paint from screen with a damp cloth as soon as screen clogs. To clean major paint clogs on screen, stop printing immediately and clean screen with warm water and non-abrasive sponge or cloth. Blot with paper towel and continue printing. They are resistant to oil based screen inks and solvents. For detail blockouts: Use Glazing Medium, Gloss Medium & Varnish or Matte Medium.